Description Of Item: Tonight, we dine in Hell! 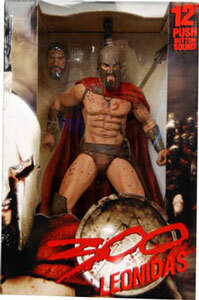 From the movie and the popular Frank Miller graphic novel, 300, comes this deluxe 12-inch tall action figure of King Leonidas. The figure features a sword, shield, spear, and two interchangeable heads. The highly detailed and movie accurate figure speaks several authentic movie phrases.